The Dry Bushveld area comprises of succulents and other drought-resistant plants sourced from various locations. Amongst these are various species of aloe including Aloe chabaudii.It grows in the open or amongst groups of shrubs and is usually stemless, or occasionally has a short procumbent stem. The flowers are deep-scarlet or brick red. 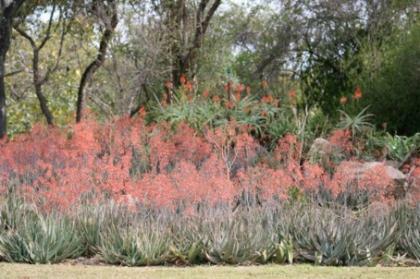 Aloes create a fine display in winter with their red, yellow or pink flowers. Also in this area is a collection of crinum species. More than half of the species occur in Africa with 21 occurring in southern Africa. Most species require full sun or very slight shade. The bulb of the Crinum bulbispermum is used by the Sotho people for medicinal purposes. 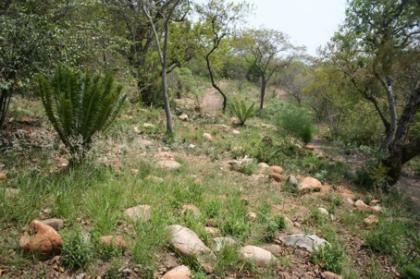 Succulents and other drought-resistant plants have been established on a dry, sunny slope among deciduous bushveld trees such as the commiphoras. 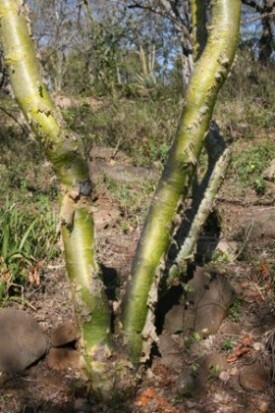 The genus Commiphora belongs to the myrrh family which is characterised by a flaking main stem and fruit with mericarps when opened, revealing a black seed with a red pseudo-aril. The flowers appear before the leaves. Most of the commiphora’s wood is of little value. However, the roots of the Commiphora marlothii are peeled and eaten because of their sweet taste. The Riverside Trail offers visitors the opportunity to experience this lovely undisturbed part of the Garden. The terrain is rugged and it is, therefore, necessary to wear appropriate footwear. Whilst walking along the trail various species such as the rare African Finfoot, certain mammals, reptiles and amphibians can be spotted. 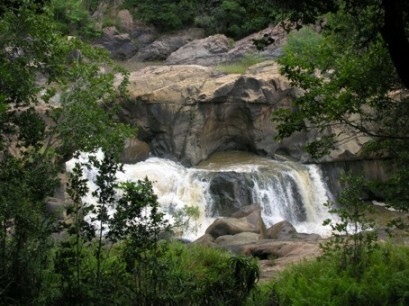 The trail passes close to the Crocodile River making the urge to splash in the river quite irresistible, but no swimming is allowed. NB: For the sake of visitor’s safety we ask that visitors intending to walk the trail first check with the entrance attendants so that security personnel can accompany them on the walk. The Riverside Trail gives visitors a chance to experience the relatively undisturbed natural vegetation that once covered most of the Garden area. This scenic walk, along a winding bush trail, takes visitors down to the banks of the Crocodile River and back up into the Garden again. 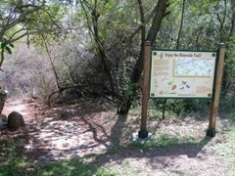 Different items of interest are to be seen at the different viewpoints on the trail. Wonderful trees to see include waterberries (Syzygium cordatum), Mitzeeri (Bridelia micrantha), red-leaved rock fig (Ficus ingens). In addition there are swamp ferns (Cyclosorus interruptus), baboon grape (Rhoicissus tomentosa) and thorny rope (Dalbergia armata). Watch out for the African Finfoot – a rare bird – mammals, reptiles, amphibians and butterflies.